How Enterprise Architects can successfully support the post-merger phase of M&As. 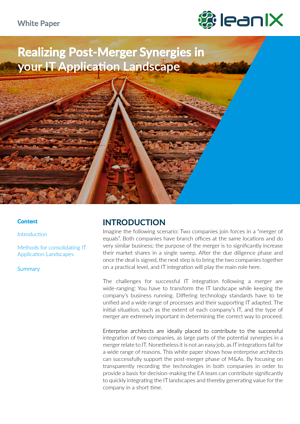 The challenges for successful IT integration following a merger are wide-ranging: You have to transform the IT landscape while keeping the company’s business running. Differing technology standards have to be unified and a wide range of processes and their supporting IT adapted. The initial situation, such as the extent of each company’s IT, and the type of merger are extremely important in determining the correct way to proceed. Enterprise architects are ideally placed to contribute to the successful integration of two companies, as large parts of the potential synergies in a merger relate to IT. Nonetheless it is not an easy job, as IT integrations fail for a wide range of reasons. This white paper shows how Enterprise Architects can successfully support the post-merger phase of M&As. By focusing on transparently recording the technologies in both companies in order to provide a basis for decision-making, the EA team can contribute significantly to quickly integrating the IT landscapes and thereby generating value for the company in a short time.